Here are my Fall/Winter Offerings in Soulwork: Small group and individual sessions using simple art processes and writing prompts to OPEN TO MYSTERY, EXPLORE LIFE’S DEPTH DIMENSIONS, and DEEPEN OUR FREEDOM. Much thinking, contemplation, scholarship, and love have gone into the planning, and I consider it an honor to be able to do my life’s work, and welcome you to join me. Also, if there is anyone you know who you think might be interested in these sorts of circles, please forward this email to them. Due to my health challenges, I really don’t have extra energy to get the word out so rely on word of mouth to find the people who would love this work. Please contact me with any questions. STORY CIRCLES STARTING IN SEPTEMBER: What is a Story Circle? After the listings below I explain the intentions and format of this work. Keep scrolling! A Poet’s Words: Falling in love with poetry. We will each choose a poet or a selection of poetry we love and each have an evening to share them with the others, along with 3 or 4 writing prompts to help us more deeply appreciate the poetry. Second Wednesdays of the month, Sept. 12 to June 12, 7-9:30 p.m. $150 or PWYC (pay what you can or barter). Making Meaning, Making Soul: Depth Dimension (i.e., spiritual) Practices of Word, Image, Dream (Narrative), and Silence to embrace independent thinking and spiritual deepening. Last Wednesdays of the month, September 26 to June 26, 7-9:30 p.m. $200 or PWYC. Untie the Strong Woman: Exploring the archetype of unconditional love in this book by Clarissa Pinkola Estes, Ph.D. She tells her personal stories of encountering Holy Mother in the most unlikely of life situations, inviting us to identify moments of illumination in our own lives. First Fridays of the month, September 7 to June 7, 1:30-4 p.m. $200 or PWYC. Wonderings about Dreams: Exploring our night dreams and/or our daydreams for meaning, insight, and guidance. We don’t pronounce on what our dreams are “telling us to do”, but invite intuition and creativity through an “If this were my dream. . . “ approach using modified Jungian and shamanic methods. Third Wednesdays of the month, Sept. 19 to June 19, 7-9:30 p.m. $150 or PWYC. The D&R (Deep and Real) Life: Apprenticing to the Sacred Exploring our ways of knowing the Sacred through examining some of the Christian Mystics and laying our lives down alongside this wisdom. From “the dark night of the soul” through “after the ecstacy, the laundry”. First Sundays of the month, Oct. 7 to July 7, 1:30-4:30 p.m. $300 or PWYC. Open Studio: Simple Art Explorations Various accessible projects in artistic expression, journalling, or card/book making. No previous art experience needed. You are welcome to join in the projects, simply play with the art supplies available, or just join in conversation and tea. Last Saturdays of the month, Sept. 29 to June 29, 1:30 to 4:30. Come when you can; no commitment to the full year. By donation. What is a Story Circle? We are a small group of 4 to 8 who meet monthly (usually September through June) for 2 ½ to 3 hours in order to delve deeply into a particular topic or practice, sharing insights and personal applications. I facilitate as sensitively as possible, creating an environment of hospitality and depth where we can articulate what we didn’t know that we knew, as well as to learn new ways to bring soul into our everyday lives. There are usually assigned readings (though optional), and I prepare writing or simple art prompts that help us reflect on and incorporate different aspects of the Story Circle’s topic. The goal is to lay our lives down alongside the life stories of others (both those of the authors we’re reading as well as each others’) in order to find and/or create meaning, understanding and richness in our inner lives. This richness radiates out into whatever we do in the world to bring wholeness and positive change whether in our families or our organizations. No one is encouraged to share more than they are comfortable with, and the meetings are designed so that each participant has several choice points regarding how much they want to share. After we respond to the prompts in writing or with image or color, we share what we wish in our “go-arounds”. Each of us having a written record of our topics, prompts, and responses adds layers of life documentation and reminders of new areas to explore. I come from an interspiritual stance where spiritual wisdom from all traditions is respected and encouraged, while also appreciating the legacy of my Catholic Christian history. I stand for personal sovereignty, critical and independent thinking, and building authentic community. The groups are educational, not therapy, though participants have found them helpful in examining and healing their suffering. I have trained in counselling and crisis intervention, especially regarding sexual violence, but am not a licensed therapist. I also offer individual sessions for counsel/planning, intentional creativity, and simple ceremony to mark life transitions. Between 1.5 – 2 hours, by appointment. About me: I am a contemplative educator, counsellor, and artist, helping women and men navigate the Depth Dimensions of their lives through image, word, silence, and dream. I believe that the most important work each of us can do is to live out our gifted selves fully, creatively, and freely, to make a home for all of us, in a world which too often wounds our bodies and souls and colonizes our minds with distractions, commercialization, and other people’s agenda. I live in the liminal places, between the worlds where spiritual reality meets ordinary life, where word (poetry, prose) meets image (paintings, journals), where wild adventure meets chronic pain, and where prairie meets mountains in western Canada. A student of the wisdom traditions of the world, I have a Masters in Education, 4 years’ graduate study and a B.A. in Theology, plus more than 30 years’ experience in service and education, including as counsellor and Executive Director of a sexual assault center. Trained in post-trauma counselling and a certified Intentional Creativity Teacher and Coach, I have taught in university, high school, professional development, and privately. I stand on the shoulders of my beloved teacher Dr. Clarissa Pinkola Estes, author of more than 30 works including the bestselling Women Who Run with the Wolves: Myths and Stories of the Wild Woman Archetype. I have studied with her for the past 8 summers in 11 week-long intensives.. I work out of my home studio in traditional Blackfoot territory in Lethbridge, Alberta, and on the internet through video calls. A 60 page chapbook of my paintings and poetry entitled Open to Mystery is now available. Prayer, and turning towards the Light — Solstice! Prayer is good thought, focused. 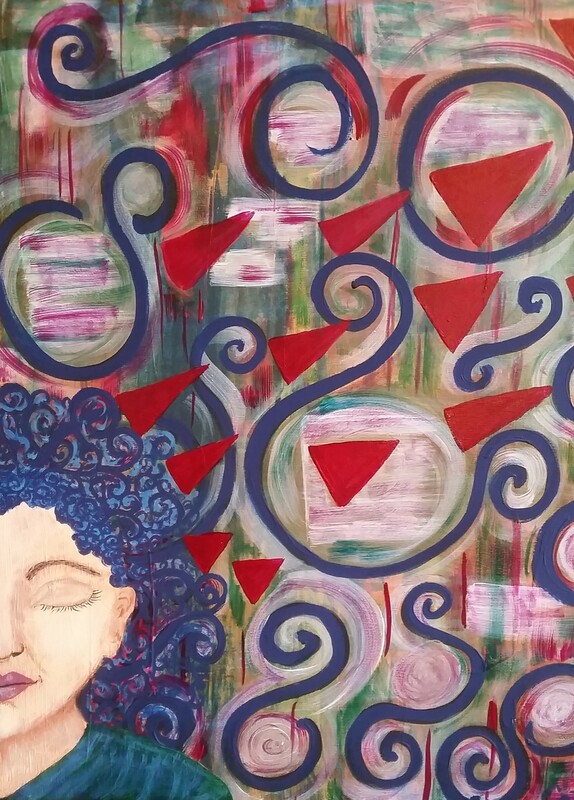 In this painting I wanted to show how our ideas (hair, here in small spirals) go out into the world (the unravelled spirals, enlarging in the background around the woman) to influence for good or ill. The red triangles are the thoughts focused, prayer. The ideas and the focused thought can help organize the matter and the spirit of our often chaotic lives. I’m just back from attending a week-long intensive with Dr. Clarissa Pinkola Estes in her series “Heart of the Wounded Healer”, held at Sunrise Ranch outside of Denver, Colorado. I’m so grateful to have been able to go, to learn so much from her and my fellow participants about psychological and spiritual healing, which of course influences our bodies’ experience of wholeness and health, and to have the chance to work through whatever is left in my own life to resolve and heal, as well. Travelling is very difficult for me, and I’m still so tired out that I’m saying I’m the best looking zombie in Lethbridge right now! So a short post today to share my painting, and to offer perhaps a new way to think about praying —- and how it may be effective. May you use your good ideas and your powers of focus to bring Light, love, and decency into our needful world. Happy New Moon! What new ideas, projects, or adventures are growing in your life these days? The poetry reading on the 28th went very well. I’m so appreciative that so many of “my people” came to hear and support me, and I had a really good time. I also took along three of my paintings that go along with some of my poetry. A real blessing that came out of the experience is that it did a lot for the “imposter syndrome” that so many of us struggle with: I feel more confident in claiming that yes, I am a poet and artist. It’s been a helluva spring, this year. Yet the white blanket sparkling in the sunshine IS pretty. . . The deer have visited in the night! Hungry, they’re cleaning up the last of the crabapples. to get to my house. blessing my neighborhood of little boxes all in a row. Wildness has visited, anointing my front yard. Holy people would wear headdresses of deer antlers. become a tree of life to ascent to the spirits. The antlers reach out to pick up new ideas on the wind. creating paths to food and survival. and to leave paths for others to find their way, too. come find us in our little boxes, all in a row. right in front of our noses. Thank you for reading my work! The Jester’s Court is a series of evenings of readings and concerts organized by Jeff Godin, who used to be part of the Most Vocal Poets group here in Lethbridge. It would be wonderful to see you there! Also, because of this event, I am CANCELLING the OPEN STUDIO for April. I plan to resume the OPEN STUDIOS on the last Saturday in May. Welcome to my world this April! I’ve just finished two university classes that I’ve been auditing this semester at the University of Lethbridge: God on Trial, a philosophy course that dealt with theodicy — the question of how to reconcile a good God with the presence of evil and suffering, and Comparative Mysticism, a religious studies course. Both were great, but together, just about killed me off —- I reluctantly have to admit that going out every day (or 4 days a week) is just not sustainable for me, health and energy wise. I had thought that since I was very excited about the courses and that the logistics were manageable, that I would be able to add them to my days. But no, getting to the courses took almost all my energy, and other projects suffered. It was really delightful, though, to relate to the profs and other students in lively intellectual discussions, something I’ve missed for many years. I’m a life-long learner, and am always taking courses on-line or in person, but the intellectual banter of the academic courses was stimulating and fun. The words in the background are “feel, think, remember”. They are cues for associating to images from dreams or stories: “When I think of x , what do I think, feel, or remember about this image?” Associating to personal images, especially in dreams or in experiences of synchronicity, is one of my prime ways of accessing inner knowledge, and in this painting I was pouring a whole set of my current concerns. A new medication I’m trying suppresses the remembering of my dreams, and that’s a big issue for me! I’m re-teaching myself all my tricks to remember dreams, and appreciating the fragments and stray images that still manage to come through. The cauldron is reminiscent of Ceridwen’s cauldron with the magical elixer — where even just three drops are enough to grant full wisdom and knowledge. The decorations on the cauldron are two intertwined snakes, visually associated both with healing (the caduseus) and with the shape of our DNA molecules, a tripartite intertwined shape reminding us of the movement in groupings of threes (thesis, antithesis, synthesis; Father, Son, and Holy Spirit; Maiden, Mother, Crone; the phases of the moon; etc. ), and a row of frogs. The frogs are imaged in the shape of a woman giving birth. For me, frogs are symbols of irrepressible energy and new possibility. In a dream I had many years ago, I was carrying a bucket that was lidded, but it was filled with a few frogs that kept leaping out of the bucket no matter how I tried to tighten the lid. The rose is a symbol of so many ideas for me, also associated with so much mythology, especially the European mythology of my ancestors. Here, the rose reminds me of the unfolding mystery of life, which never fails to pull me in. My intention for this New Moon is to develop a new habit: I will check email and the internet no more than three times daily. I don’t have a problem with internet addiction, but I’m certainly not immune to the dopamine hits of an email here, a FB message there. And I want more of my time to be invested in exploring the mysteries that call to me, rather than finding that I’ve unintentionally spent an hour, for the 3rd or 4th time today, lost on the internet highways. So! We’ll see how it goes. If only three drops of the magical elixer are enough for all wisdom and knowledge, then I figure that three check-in’s per day on the internet is enough for what I might need, too. Thank you for reading this far, and thank you for the many wonderful comments so many of you share with me about my artwork and blog. May your Spring blossom beautifully! Happy Spring! Celebrate with a snowstorm! Just a few days before the Spring Equinox, just before today’s New Moon, after a wonderful thaw that was melting the mountains of shovelled snow —– we got a snowstorm! It looked just like my photo above! We got our car stuck in the snowy alley. Then dear spouse went to his sister’s home here in town to use their car (the sister is in sunny, warm Mexico at the moment!). He got IT stuck, though fortunately it’s stuck in front of their house out of traffic. Lots of activity has ensued, involving shovels and frustration. Both cars are still stuck. in moving forward without flipping. I was wakened at 7:30 am by a third tow truck driver who said he was coming over. I told him what happened to the other two trucks, but he said he was coming anyway. So I went out, and dug for awhile. Somewhere in there while I was going in and out of he house he took a look at the situation and called Liberty, who told me, and I called the tow truck driver back. He said I should call the city and ask them to plow the alley before he went in. I called the city. The woman said “We don’t do alleys.” I said “How is the garbage truck going to get down the alley with my car blocking it?” The woman said “I don’t know” and hung up. I went in the house to get breakfast, planning to catch the bus over to Joan and Wolf’s to take care of the cats. While I was having breakfast the fourth tow truck driver called. “I have a four wheel drive” he said. “This truck is like a mountain goat. I’ll get you out.” So the fourth truck showed up. With a lot of manouvering we got my car unstuck, and I drove down the alley to the corner, but got stuck again. So we did a lot more manouvering, and he got stuck too. After about an hour of innovating in some very strange ways – putting a metal plate under the hoist, and using the hoist to push the tow truck along – kind of like a dog on ice propelling himself forward by sticking his tail in a hole in the ice and forcing himself forward a few inches instead of using his legs – the fourth tow truck got unstuck, and then got me unstuck too. So by noon I got to Joan and Wolf’s. Before this is all over, the CAA/AMA will know us by first name. . . .
And too many of my friends are wearing casts as a result of the ice hidden under the snow! p.s. Our car in the back alley became unstuck an hour or so ago, with the energies of three strong adult men. Now we just can’t let dear spouse try to park in the alley when there’s this much snow. . . . . Ever notice how people around the world celebrate the New Year on different dates? Lots of ways to proclaim something new. Day One. I’ve taken on a gentle practice of noting and doing simple ceremony on each month’s new and full moons. Noticing the moon, feeling the passage of time, feeling the circle moving round again yet one more time, extends my mindfulness outside of my own psyche. It’s a challenge to be aware of what is outside of and around myself without also getting caught up in the daily new cycles, overwhelmed by the same old same old of “if it bleeds, it leads”. There is plenty of bleeding. Yet this, too, is true: as our earth moves through space, we each day can see a different face of the moon. Things change, and things return, again and again. There are rhythmic points of newness (first sliver of moonlight after the dark of the moon) every month, and any of us can call any day our “new year”. Day One. What new cycle are you moving into? What kinds of rhythms are you paying attention to these days? This painting, acrylic on watercolor paper, is one I did two weeks ago on the Full Moon. I was thinking of fire and passions (not necessarily romantic), of the difference between bonfires and hot coals. Fire contained and directed can cook up the next alchemical transformation. . .
What’s being cooked up in your life? Something new? Something tried and true? For this first New Moon in January, here is my latest piece of artwork, a collage for the new year, incorporating my word (phrase) of the year, “Driven? or Drawn?”. It’s to remind myself that what I LOVE, what I’m drawn to, is what I “ought” to do and to be. For too much of my life I’ve done what I’ve thought I ought to do. Which on its face is actually a very good plan. Yet, as a good Catholic girl I was thoroughly indoctrinated that the very best thing that one could do is to “offer up” what you love most, to God, for the good of . . . whatever/whoever. That is, to give up and to deny ourselves what we most want is the greatest sacrifice of all. You know: if you aren’t dead yet, you haven’t given enough. I could write a book or three deconstructing that terrible, false, limiting belief. Actually, it’s social/religious brainwashing. Where were the ideas that we “ought” to do exactly the good that we are inspired to do? That we are uniquely gifted with attributes where we can joyfully offer who we truly are for the betterment of ourselves AND the world as well? Yet old ideas, especially when inculcated young, and when they have to do with being good, or are about survival, or pleasing “God”, sometimes are rooted so deeply that it seems they’ve become part of our DNA. These are old beliefs that have harassed me for a long time. In early December I constructed a simple ceremony, with intention, the elements, using all the senses, and also including image and writing. It has really helped to release these final remnants. This collage is another way to reinforce this release. On the collage, you can just barely see a man whipping a figure (me) to “do more, do more” — it’s on the left, on top of the honeycomb, where the upside down “U” is the curled whip. Then there’s the present figure of me (just above my photo) walking arms out toward what I love, represented by the golden sun. The owl and the antlered (shaman) woman are the companions I choose to help me with this, based on their ancient symbolisms. And the quote is from Rumi, the 13th century Islamic mystic who radiated love and joy. Creating these types of simple ceremonies is also part of the work I do with others. Feel free to contact me for more information. May you move into the year with joy, spaciousness, and “enough”. Happy New Moon, in this week of light revealing itself after such darkness —- literally in the new moon appearing, in the Winter Solstice (in the northern hemisphere), in the lights of Christmas, and metaphorically in the sunflower of my painting as light at the center of my being, in perseverance in the darkness of depression, in hope that justice and compassion will prevail in the conflicts of our world. Both sunflowers and roses have deep meanings for me. Both unfold petals, and seeds in the sunflowers, in beautiful patterns of universal growth: Fibonacci sequences of beauty and practicality, “sacred geometry”. Sunflowers are such happy flowers. I love how they move throughout the day, following the light of the sun. They model for me how I want to be in the world: to be of use, as sunflowers give nourishment through their abundance of seeds, and to be of beauty and encouragement. They live and offer themselves wherever they are, whether in a backyard, a florist’s shop or a roadside ditch. I want to be like the sunflower —- beautiful, among so many others who are beautiful; special, among so many other special individuals; ordinary, among so many other ordinary beings. Roses speak to me of the Great Mystery of life —- mystery not as something that can never be known, that we just have to accept, but rather mystery like a rose that continually unfolds, revealing more and more complexity, and beauty, as the mystery unfolds in our hearts and lives. And it’s the Mystery of life that is the “Beloved” of my poem below. I don’t know what “God” is, if God “is”. So much I don’t know. (Ask me 35 years ago and I would have had lots to say. Now, not so much.) But I do know there is Love, and the possibility of Love, within ourselves, able to be offered and received. So in this season, be of good cheer, be as well as possible. Don’t lose hope in love. I raise my eyes to you, my Beloved. Let me attend to you, my Love, my Life. your geometries of Beauty, Love. are known wherever we step. seeing You, I see all. Can you hear the angels singing. . . when you’re online? Bus 22. (c) Cat Charissage, 2015 a.r.r. I had an image today: I saw myself as an old woman in the middle of a noisy open market, like a farmer’s market. I felt a lot of affection for everyone there, but I also couldn’t hear myself think. So I lovingly turned, walked away, and walked into the forest where I had a tiny cottage a la Baba Yaga. I looked forward to getting back to the quiet, to listen to the angels singing. I’m spending more time offline theses days, and REALLY appreciating that. I didn’t realise how much I needed it until I’ve been listening to the silence. Of course I’m still on the computer more than I’d like, but am slowly overcoming my FOMO (fear of missing out). Actually, fear of missing out is only a small part of it for me — I’m interesting in a lot of things, and want to learn a lot more about those things. And, of course, there is so much to be found of people’s writings and blogs and online courses. . .
What does tempt me is all the googling of my interests, finding the serendipitous articles that keep me clicking on the next article or video. Following authors’ blogs is a strong temptation. Two or four is reasonable, but not 28. Shall I even mention Pinterest? (No, I do not go there!!) I can keep instagram down to a dull roar, even though I’m deeply interested in images. Yet I’m mostly interested in how people come up with their symbolism and how they make meaning in their art, so instagram often doesn’t have enough for me. As a result of these questions, I’m realising that at least for right now, I know what I want and need to know for what I want to learn and to do next. May you find peace and balance in your relationship with all that clamors around you. May you hear the angels (as well as the mermaids) singing. Happy new moon!